What will it take? What will it take to see a world that knows Jesus? The age of mission has been going for almost 2000 years, since the Lord Jesus’ Great Commission to the first disciples. We are still a church on mission! So what will it take to see this mission move forward towards the day when every tribe and tongue and language and nation will bow before the Lamb’s throne of grace? What does the narrative of the Book of Acts teach us about God’s plan for God’s mission to the world? Is there a pattern to follow? We believe the answer is a firm yes! 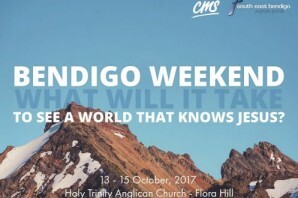 The South East Bendigo Anglican Parish and CMS partner again for this great event. Join us for a weekend of challenge and encouragement as we consider God’s mission plan for his world.